3) Project Plan: Once we completed the initiation phase (preliminary estimates), we need to create a project plan assigning resources to project and schedule those tasks. Project schedules can be presented in many ways, including simple lists, bar charts with dates, and network logic diagrams with dates, to name just a few. 4) Validation Step: Remember 21 CFR Part 11 compliance for Computer Systems Validation? The risk management effort is not a one-time activity on the project. Uncertainty is directly associated with the change being produced by a project. The following lists some of the tasks that are performed as it pertains to validation. 5) Transformation Specification: Dataset transformation is a process in which a set of source datasets and its variables are changed to meet new standard requirements. For example, variable name must be 8 chars long. The variable label must not be more than 40 chars in length. Combining values from multiple sources (datasets) into on variable. 9) Data Definition Documentation: In order to understand what all the variables are and how they are derived, we need a annotation document. This is the document that will be included during data submission. SAS PROC CONTENTS can help in the generation of this type of metadata documentation. 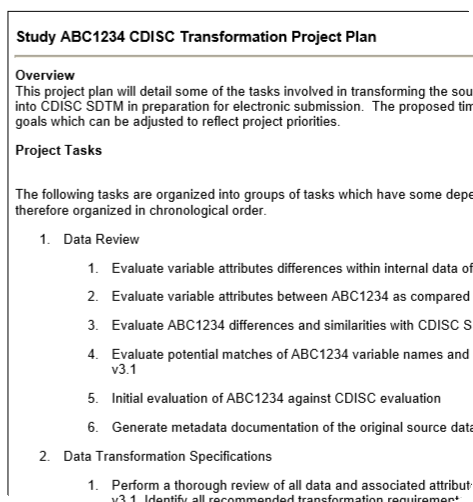 The last step in the project plan for CDISC implementation is to generate the documentation in either PDF or XML format.